Junior CB Devyn Bryant (#3) is a nominee for the 2015 Allstate AFCA Good Works Team®, the most esteemed off the field honor in college football. Redshirt freshman Anthony Lawrence will be the starting quarterback for the University of San Diego Toreros (0-1) when they host the Western New Mexico Mustangs (1-0) in the home opener this Saturday. Lawrence takes over for Trey Wheeler who injured his non-throwing shoulder during last week's 37-3 loss to San Diego State. It will be the first collegiate start for the former Grossmont High standout who finished his prep career as the San Diego Section's career leader in passing yards (9,079), touchdowns (96) and completions (691). During his playing time against SDSU, Lawrence completed 9 of 14 passes for 71 yards and led USD to its only scoring drive of the game. Due to injuries to Jonah Hodges and Dallas Kessman, also getting his first career start on Saturday is junior running back Blake Martin. He'll share carries with San Pasqual product Jereke Armstrong. 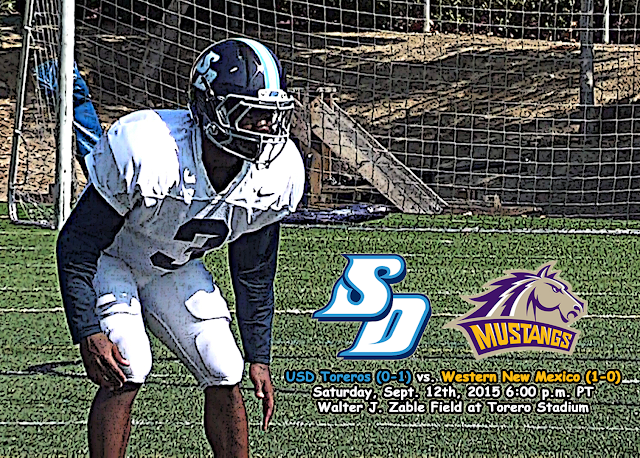 While the Toreros own a 4-0 advantage in the all-time series against Western New Mexico, the last three games have been decided by seven points or less. The Mustangs are coming off a 70-14 win over Arizona Christian.